Christina Hutten is working on obtaining a complicated doctorate in music at UBC. She is a master of keyboard instruments. 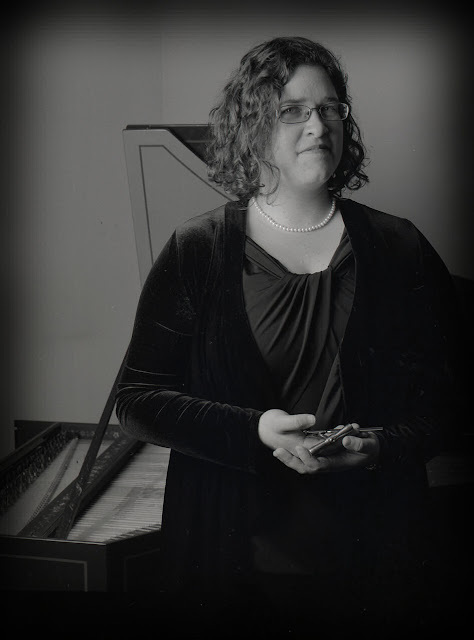 In her role as Our Woman Friday at Early Music Vancouver and Pacific Baroque Orchestra concerts she is usually seen tuning the harpsichords. In several conversations with Hutten I have come to the conclusion that she is a perfectionist and does not abide with people who do not get their facts accurately. My advice to anybody who might want to play poker with her is, "Don't," you would lose your shirt. I have heard her play the organ and can assure you that you are in for a treat this coming Saturday, September 26 at Wesley United Church on Burrard and Nelson. Next Saturday, September 26, you are invited to celebrate Culture Days with me at St. Andrew's Wesley United Church, where I will be giving afternoon organ demonstrations and an evening organ recital. The organ demonstrations will begin at 4:15 and 5:00 PM. I plan to begin with some music, and then invite you to join me in exploring the workings of the mechanical-action organ in the side chapel at St. Andrew's Wesley. The church's music director, Darryl Nixon, will demonstrate the large organ in the church sanctuary. You can find more information about the event here. My recital will begin at 7:00 PM. Since St. Andrew's Wesley is such a large, beautiful space, I invite you to come to listen and to explore the church, rather than sitting solemnly in a pew for the duration of the concert. I will have to do some walking myself, since I intend to perform on both the main organ and the chapel organ. The programme will include music by Bach, Mendelssohn, Froberger, and Bruhns. Find more information including a map of the church's location here. Both events are free, though donations are welcome. Please do not hesitate to invite friends and bring the children in your lives.